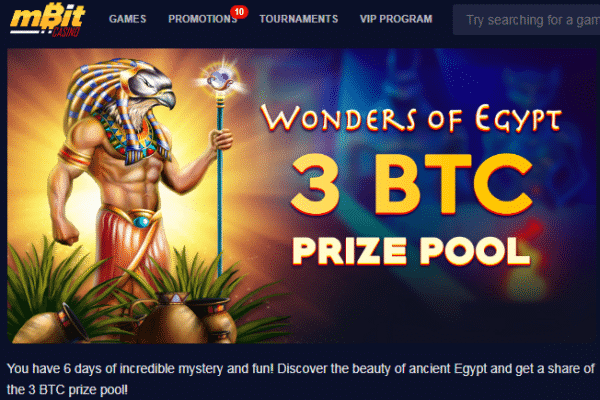 If you’re passionate about playing Bitcoin slot machines online and you like Egyptian-themed games, mBit Casino just opened a new slot tournament with a 2.85 BTC prize pool that is offered completely wager-free. And if that’s not enticing enough for you, you can also find another 400 mBTC tournament at the casino as well as a new competition at Fortune Jack’s where you can win a slice of 750 mBTC and a portion of a massive 500 free spins giveaway. Keep reading for more info on each competition and get your muscles warmed up for some exciting slot entertainment! Places 36-50 – 0.021 BTC. For each 0.0003 BTC you spend on Book of Immortals, Eye of the Amulet, and Scrolls of Ra, the casino will give you 1 point for the leaderboard. The more points you get, the higher you climb. And what’s really great is that all prizes are given WAGER FREE! Another tournament the casino is running this week is the Slots Frenzy tour which will last until next Wednesday. For this competition, you can play any slot game at the casino you want with real wagers to earn points and a share of 400 mBTC and 500 free spins. For more about the rules of the tournament and the Wonders of Egypt promotion, you can use this link to navigate to mBit Casino. For more slot tournaments, you can check out the Hot Slots competition at Fortune Jack Casino which will start after midnight tomorrow. Like every week, players will get a chance to play any slot game they want and earn points with each wager they place. There is a total of 750 mBTC in prizes to be claimed + 500 free spins and they are all given without any wagering requirements attached to them. If you climb to the top three positions, you can win a free reward of 200 mBTC, 150 mbTC, or 100 mBTC, respectively. The free spins prizes, on the other hand, start at 25 free spins for places 21-30 on the leaderboard while the last players to qualify (41-50) will get 10 free spins each. If you like to get more information on the rewards or rules, make sure to pay a visit to Fortune Jack casino.